Big​ ​Software​ ​is​ ​a​ ​new​ ​class​ ​of​ ​application.​ ​It’s​ ​composed​ ​of​ ​so​ ​many moving​ ​pieces​ ​that​ ​humans,​ ​by​ ​themselves,​ ​cannot​ ​design,​ ​deploy​ ​or operate​ ​them.​ ​OpenStack,​ ​Hadoop​ ​and​ ​container-based​ ​architectures​ ​are all​ ​examples​ ​of​ ​​Big​ ​Software​. You​ ​usually​ ​need​ ​to​ ​warehouse​ ​months​ ​of​ ​history​ ​of​ ​these​ ​metrics​ ​so​ ​you can​ ​spot​ ​trends.​ ​This​ ​enables​ ​you​ ​to​ ​make​ ​educated​ ​infrastructure decisions.​ ​That’s​ ​a​ ​powerful​ ​tool​ ​that’s​ ​usually​ ​offered​ ​on​ ​the​ ​provider level.​ ​But​ ​what​ ​if​ ​you​ ​run​ ​a​ ​hybrid​ ​cloud​ ​deployment?​ ​Not​ ​every​ ​cloud service​ ​is​ ​created​ ​equally. The​ ​Elastic​ ​folks​ ​provide​ ​everything​ ​we​ ​need​ ​to​ ​make​ ​this​ ​possible. Additionally​ ​we​ ​can​ ​connect​ ​it​ ​to​ ​​all​ ​sorts​​ ​of​ ​other​ ​bundles​ ​in​ ​the​ ​charm. Big Software is a new class of application. It’s composed of so many moving pieces that humans, by themselves, cannot design, deploy or operate them. OpenStack, Hadoop and container-based architectures are all examples of Big Software. Gathering service metrics for complex big software stacks can be a chore. Especially when you need to warehouse, visualize, and share the metrics. It’s not just about measuring machine performance, but application performance as well. You usually need to warehouse months of history of these metrics so you can spot trends. This enables you to make educated infrastructure decisions. That’s a powerful tool that’s usually offered on the provider level. But what if you run a hybrid cloud deployment? Not every cloud service is created equally. Beats – lightweight processes that gather metrics on nodes and ship them to Elasticsearch. First, install and configure Juju. This will allow us to model our clusters easily and repeatedly. We used LXD as a backend in order to maximize our ability to explore the cluster on our desktops/laptops. Though you can easily deploy these onto any major public cloud. Note: if you wish to deploy the latest version of this bundle, the ~containers team is publishing a development channel release as new beats are added to the core bundle. Let’s connect it to something interesting, like an Apache Spark deployment. We also recommend running `juju status` periodically to check the progress of the deployment. You can also just open up a new terminal and keep `watch juju status` in a window so you can have the status continuously display while you continue on. In this bundle: Filebeat and Topbeat act as subordinate charms. Which means they are co-located on the spark units. This allows us to use these beats to track each spark node. 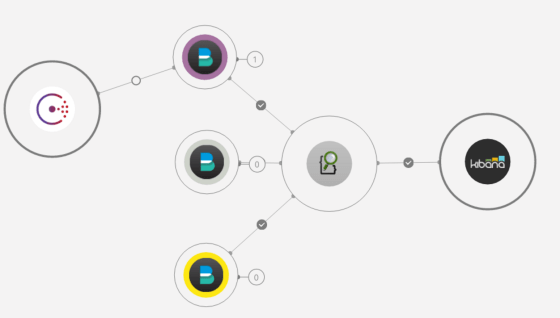 And since we’re adding this relationship at the service level; any subsequent spark nodes you add will automatically include the beats monitors. The horizontal scaling of our cluster is now observable. Notice that this time, we used charm config instead of an action to deploy the dashboard. 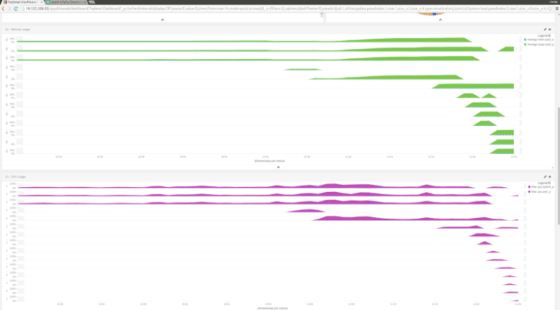 This allows us to blanket configure, and deploy the kibana dashboards from a bundle. Reducing the number of steps a user must take to get started. After deployment you will need to do a `juju status kibana` to get the IP address of the unit. Then browse to it in your web browser. For those of you deploying on public clouds: you will need to also do `juju expose kibana` to open a port in the firewall to allow access. Remember, to make things accessible to others in our clouds Juju expects you to explicitly tell it to do this. Out-of-the-box we keep things closed. You can find more about available actions in the bundle’s documentation. Feel free to launch the action multiple times if you want to exercise the hardware, or run your own Spark jobs as you see fit. Here you can see the CPU and memory consumption of the cluster. You can see the initial three nodes hanging around, and then as the other nodes come up, beats gets installed and they report in, automatically. So when spark is added, you’re not just adding a new machine, you’re mutating the scale of the application within the model. But what does that mean? A good way to think about it is just like simple elements and compounds. For example: Carbon Monoxide (CO) and Carbon Dioxide (CO2) are built from the exact same elements. But the combination of those elements allow for two different compounds with different characteristics. If you think of your infrastructure similarly, you’re not just designing the components that compose it. But the number of interactions that those components have with themselves and others. So, automatically deploying filebeat and topbeat when spark is scaled just becomes an automatic part of the lifecycle. In this case, one new spark unit results in one new unit of filebeat, and one new unit of topbeat. Similarly, we can change this model as our requirements change. This post-deployment mutability of infrastructure is one of Juju’s key unique features. You’re not just defining how applications talk and relate to each other. You’re also defining the ratios of units to their supporting applications like metrics collection. We’ve given you two basic elements of beats today, filebeat, and topbeat. And like chemistry, more elements make for more interesting things. So now let’s show you how to expand your metrics-gathering to another level. Elastic has engineered Beats to be expandable. They have invested effort in making it easy for you to write your own “beat”. As you can imagine, this can lead to an explosion of community-generated beats for measuring all sorts of things. We wanted to enable any enthusiast of the beats community to be able to hook into a Juju deployed workload. Beats Base provides some helper python code to handle the common patterns every beats unit will undergo. Such as declaring to the model how it will talk to Logstash and/or Elasticsearch. This is always handled the same way among all the beats. So we’re keeping developers from needing to repeat themselves. Let’s start with Packetbeat as an example. Packetbeat is an open source project that is designed to provide real‑time analytics for web, database, and other network protocols. With those meta files in place we’re ready to write our reactive code. This completes our need to deliver the application. The apt-layer will handle all the usual software delivery things for us like installing and configuring an apt repository, etc. Since this layer is reused in charms all across the community, we merely reuse it here. The next step is modeling how we react to our data-sources being connected. This typically requires rendering a yaml file to configure the beat, starting the beat daemon, and reacting to the beats-base beat.render state. The configuration for packetbeat comes in the form of declaring protocol and port. This makes attaching packetbeat to anything transmitting data on the wire simple to model with configuration. We’ll provide some sane defaults, and allow the admin to configure the device to listen on. default: "http:80 http:8080 dns:53 mysql:3306 pgsql:5432   redis:6379 thrift:9090 mongodb:27017 memcached:11211"
# This file is controlled by Juju. Hand edits will not persist! With all these pieces of the charm plugged in, run a `charm build` in your layer directory and you’re ready to deploy the packetbeat charm. 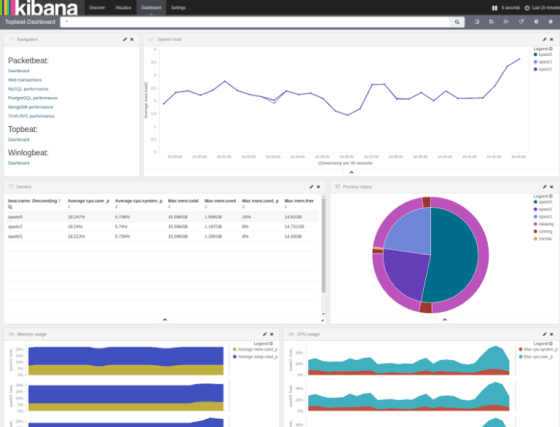 Load up the kibana dashboard, and look under the “Discover” tab. There will be a packetbeat index, and data aggregating underneath it. Units requesting cluster DNS will start to pile on as well. To test both of these metrics, browse around the Consul UI on port 8500. Additionally you can ssh into a unit, and dig @ the consul dns server to see DNS metrics populate. Populating the Packetbeat dashboard from here is a game of painting with data by the numbers. Observability is a great feature to have in your deployments. Whether it’s a brand new 12-factor application or the simplest of MVC apps. Being able to see inside the box is always a good feature for modern infrastructure to own. This is why we’re excited about the Elastic stack! We can plug this into just about anything and immediately start gathering data. We’re looking forward to seeing how people bring in new beats to connect other metrics to existing bundles. We’ve included this bundle in our Swarm, Kubernetes and big data bundles out of the box. I encourage everyone who is publishing bundles in the charm store to consider plugging in this bundle for production-grade observability.